Find hotel near Athens Central Meat And F ..
Central Municipal Athens Market is a large public market where you can find raw meat, fish and other seafood. It houses several food courts in one part where you can find a variety of dishes of fish and meat. On the other part you can find that it sells various vegetarian items like fruits, vegetables and dairy products. The street on which the market takes place possesses a beautiful scene. It welcomes the visitors with cameras and hence you can capture some of the most memorable moments here. It houses many restaurants from where you can you can fill your tummies with various foods. A Kafeion is housed in the Central Municipal Athens Market where you can enjoy decent selection of drinks. If you visit Athens, this should be a must see: a hidden gem. The fish market is super amazing: you can find all kinds of fish. Get here early, maybe before 12pm. on the other side of the street you can find a market for vegetables. many locals are shopping there. we got some olives. they allow you to taste from any kind. 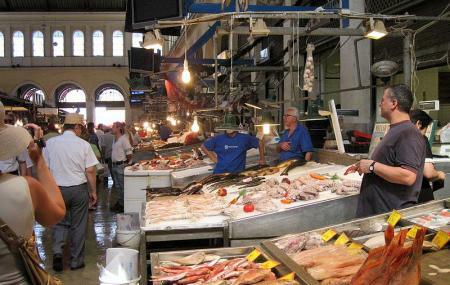 The market offers fresh meats and fishes. The wrought iron steel structure of the roof is very beautiful. They also have an old taverna with home cooked menu that open 24 hours, it is very recommended if you want to try authentic Greek food. Fascinating warren of small stalls close to Athens City Hall, selling fresh meat, fish and produce. Although most items for sale can't be kept for long and are therefore of limited interest to visitors from abroad, the place does have a interesting atmosphere if you enjoy markets. Lining the street side of the building are the fruits and nuts vendors. Pick up some salted pistachios, they're delicious! Lively, vibrant market! Full of shops, cafes, restaurants, and live music. Lots to see and so much good food! It was wonderful to just wander the shops and get lost in the market. Awesome place. You can buy here fresh meat, vegetables, fish or spices. Great experience.